This month, I am reviewing Burseraceae, which is a moderate sized plant family that is also known as the Torchwood or even the incense family. The family comprises of both trees and shrubs and is native to tropical regions, such as Africa and Asia. The plants have been used for hundreds of years in traditional medicine and there has been some interesting scientific studies done which support some of the claims made regarding efficacy, discussed in more detail below. Frankincense (Boswellia carterii) and Myrrh (Commiphora myrrha) trees belong to the Burseraceae family. Both trees produce a gum or resin. The essential oils or absolutes extracted from the resins are commonly used in Aromatherapy and are generally regarded as safe for topical use on adults although they are not recommended for children. A patch test is recommended for those with sensitive skin. 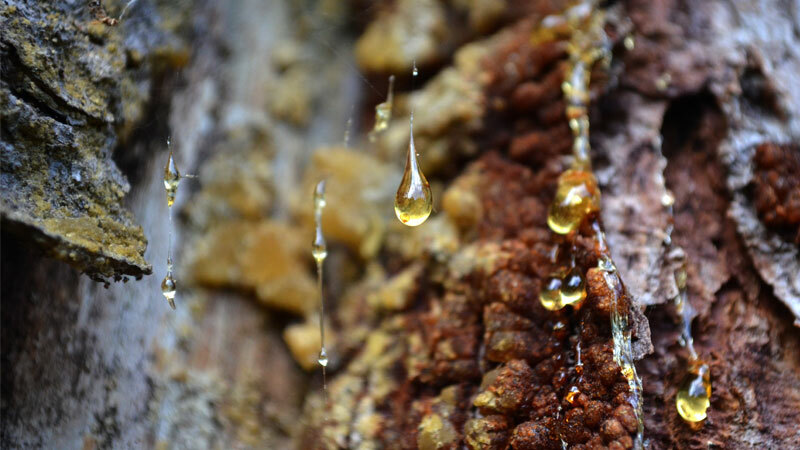 Both Myrrh and Frankincense are obtained by cutting the bark of the tree and allowing the resin to ooze out. The hardened resins are called ‘tears’. Two methods of extraction can be used to extract the essence from the resin: Steam distillation produces an essential oil, whilst solvent extraction produces an absolute. In both cases the resulting liquid tends to be pale-yellow or pale-amber-brownish colour. Frankincense is said to have a warm, balsamic aroma, whilst Myrrh is said to have a warm-spicy odour. Many people also associate both oils with Christmas, as they were two of the three gifts given to baby Jesus by the three wise men, hence why they are popular ingredients in festive fragrances and pot-pourri. Frankincense was called ‘Olibanum’ in older texts, which is thought to derive from the Latin ‘Olium Libanum’ (Oil from Lebanon). It originates from Africa, Western India and Southern Arabia, but most supplies now come from Somalia and Ethiopia where the trees are found in abundance. Frankincense resin has been burnt on altars and in temples since ancient times, and it was once considered one of the most prized and expensive substances in the world. The name Frankincense comes from the Mediaeval French meaning ‘Real Incense’. Today, Frankincense is still used as an incense, and thanks to its ability to slow down and deepen the breathing, makes an excellent aid to meditation and prayer. It is used in many Christian churches to quieten the mind and encourage contemplation, while other religions believe that its scent attracts angels and dispels evil spirits (1). In addition to its ritual and ceremonial uses, Frankincense was traditionally a much sought-after perfume, cosmetic and medicinal ingredient. The ancient Egyptians used it for embalming and it has also been used for thousands of years in traditional Chinese medicine to alleviate pain and inflammation. Frankincense’s anti-inflammatory and expectorant properties have been supported in scientific studies showing that it reduces inflammatory conditions such as rheumatism, irritable bowel syndrome and asthma (2). Researchers at Cardiff University also demonstrated that it possesses an active ingredient that helps relieve arthritic pain by reducing the inflammation that breaks down cartilage. Its expectorant and nervine properties mean that it is also indicated for use with respiratory conditions such as bronchitis and catarrhal problems, and for emotional issues including anxiety, depression, nervous tension and stress. However, disappointingly, a literature search showed no evidence to support these claims. Frankincense is also found in many skincare products, especially those aimed at more mature or ageing skin. It is thought to have a tonic effect, helping to restore tone to slack, sagging skin and slow the appearance of wrinkles. In my opinion, Frankincense blends particularly well with Geranium (Pelargonium graveolens), Lavender (Lavandula angustifolia) and the citrus oils such as Mandarin, Tangerine (Citrus reticulata) and Sweet orange (Citrus sinensis). Unsurprisingly, Myrrh (Commiphora myrrha) essential oil has similar, if not identical properties to Frankincense. It originates from Africa and Arabia with its name coming from the Arabic word ‘murr’ meaning ‘bitter’. Renowned in ancient times as an ancient spice it was used in perfumes, incense, medicines and for anointing the dead. Ancient Greek soldiers used it for healing wounds, and it is still used today for its antiseptic, healing and anti-inflammatory properties that are particularly helpful for dry, cracked skin, weepy skin conditions and wounds that are slow to heal. It is excellent for the gums, and can help to heal mouth ulcers, and its fungicidal properties are thought to be good for treating athlete’s foot. The oil is also said to be anti-microbial and this is supported by a laboratory study published in Letters in Applied Microbiology in 2012, which found that a combination of Myrrh and Frankincense essential oil may help fight infection by destroying or suppressing the growth of microorganisms (3). Like Frankincense, Myrrh is a useful expectorant and pulmonary antiseptic and is ideal for use in inhalations or chest rubs for coughs, bronchitis, chest infections, catarrhal colds and sore throats. Anecdotal claims suggest that it can also be used to alleviate the discomfort of indigestion and as a remedy for diarrhoea. While Myrrh can be used to calm the mind, having sedative properties, I prefer Frankincense, as I think its aroma is more pleasant. I tend to use Myrrh for more physical conditions. I have noticed in practice that it blends particularly well with citrus oils such as Lemon (Citrus limon) and Lime (Citrus aurantifolia), as well as other essential oils including Benzoin (Styrax benzoin) and Patchouli (Pogostemon cablin). While some experts state that Myrrh essential oil is non-toxic, non-irritating and non-sensitising, some report that medications for diabetes and blood clotting interact with Myrrh (4). Place a handful of dried leaves, and fruit into a plastic container. Add orris root powder fixative and a couple of drops each of Frankincense, Myrrh and Mandarin essential oil. Shake thoroughly to mix and seal. Store in a warm dark place until ready to use. Place in an attractive bowl and add some festive decorations. Combine 50ml Moisturising Cream, 1ml Hemp Seed Oil, 3 drops Myrrh, 3 drops Frankincense and 2 drops Geranium. Blend 2 drops of Myrrh with 5ml of Neem oil. Clean affected area and dry thoroughly and apply the oil twice a day. Mix 4 drops of Lemon, 2 drops of Myrrh and 1 drop of Benzoin with 15ml of Moisturising Lotion. Apply to chest twice a day.